THE smart alecks will try to tell you it doesn’t matter. THE smart alecks will try to tell you it doesn’t matter. Every team plays each twice – once at home and once away. When it happens is a statistical curiosity, and anyone trying to read too much into the fixture programme may as well be reading tea leaves. Good teams win games and have good seasons, bad teams don’t, they’ll say. Don’t believe it for a second; it matters. Just ask Steve Bruce, who was left cursing a fixture list that threw his newly-assembled Sunderland the worst possible curve ball in the shape of arch local rivals Newcastle. Their season never recovered, and Bruce will be kicking off the 2012/13 campaign in Hull. So yesterday’s announcement makes a difference, and Alan Pardew might have cause for celebration that Newcastle begin at home against a team set for a turbulent summer. No team gave Newcastle more problems than Tottenham last season, with United expending every last drop of effort to earn a 2-2 draw at St James’ Park before a 5-0 reverse that included the most painful moments of the campaign for Pardew. This time around the challenge will be a different one. Spurs will be under new management and it appears increasingly likely that Luka Modric, their nimble playmaker, will be elsewhere. Newcastle, by contrast, will have started their competitive fixtures by then and so should be fitter and more prepared for their Europa League qualifiers. Pardew will hope the same is true of their second game, away at European champions Chelsea. Martin O’Neill will not be so enamoured with the North London challenge that was handed to Sunderland on the opening day – but the rest of their late-summer programme looks more acceptable. Reading, Swansea, Wigan and West Ham provide four of the six early opponents for the Black Cats, and an early opportunity for them to reverse the worrying form that left Wearside so downbeat at the conclusion of last season. It is an easier exercise to predict Black Cat fortunes than it is Magpies. For a start, Newcastle will expect few of their games to take place on the days listed yesterday, with a European campaign to be factored into the equation. That could have a pretty serious impact, all told. For when we look at a mid-winter programme that sees Newcastle face West Brom, Liverpool, West Ham, Swansea, Southampton and Stoke in succession we should perhaps see beyond the relatively gentle November and consider that this is when the Europa League really kicks into gear. United may have to prioritise certain games and the squad will certainly be stretched during those weeks, especially if Newcastle have made the sort of League Cup progression that they hope for. Christmas doesn’t bring many presents for Pardew, either. December 15 sees a clash with champions Manchester City before a home game against notoriously bad travellers QPR. Then it is back-to-back trips to Manchester United and Arsenal, on Boxing Day and December 29 respectively to give them a real festive work-out. It is the start that will be important, though – and Pardew will be targeting a flier after that trip to Stamford Bridge. Villa, Everton, Norwich and Reading give Newcastle a chance to put points on the board as they look to consolidate their place in the Premier League’s top seven while also constructing genuine challenges in knockout competitions at home and abroad. At least both sides will have a chance to establish themselves before the first Wear-Tyne derby on October 20. Sunderland, once again, will host the first of these two electric clashes, and Pardew and Newcastle will be braced for an especially hostile reaction after the fireworks of the last game. But by then we will have a feel for how these two teams are shaping up this season – rather than a repeat of last term’s defining fixture. Then, Newcastle took strength from their derby win and began to consign a tempestuous summer to the memory, while Wearside optimism after an apparently profitable close season vanished in an instant. Whatever the result of the first Wear-Tyne clash, you can’t help but feel December looks treacherous for O’Neill’s men. After Chris Hughton’s Norwich at Carrow Road, Sunderland are engaged with Tottenham, Manchester United, Manchester City and Chelsea during the festive month. At least their two Christmas games are at home, although Sunderland supporters can shake off their New Year hangovers at Anfield. Liverpool under Brendan Rodgers may be a different proposition. Other afternoons of note include September 22, when Hughton (below) returns to St James’ Park for the first time. It should be a joyous occasion for their former manager as he returns to Tyneside some two years on from his unceremonious sacking. Sunderland welcome Manchester United on December 15, a game that will no doubt be given extra edge by the comments attributed to Wayne Rooney and Sir Alex Ferguson about Black Cats fans “enjoying” their last-day disappointment at the hands of their local rivals. The Black Cats finish at Tottenham; Newcastle are at home to Arsenal. Let’s hope that European dreams are on both teams minds by the time those games arrive in mid-May. 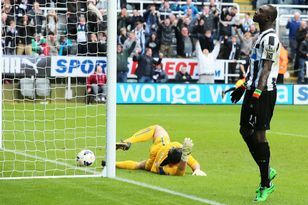 ROB Elliot plans to step up from uncomplaining reserve and provide genuine competition for Tim Krul this season.